This holiday home offers the perfect spot to sit back and have a relaxing holiday. Located close to town, Remarkable Vista is situated in a tranquil cul-de-sac, elevated for sun and views. Outdoor living is provided from extensive decks including a conservatory. 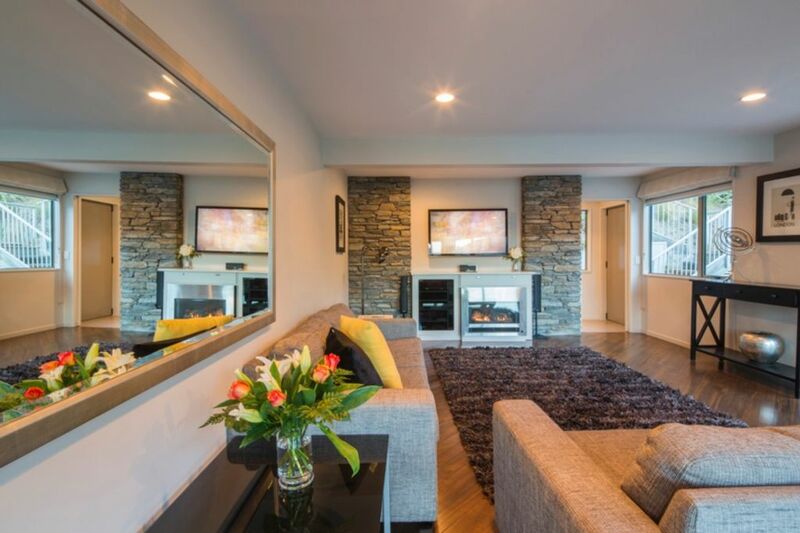 A great way to sit and plan your day ahead or unwind and relax with a glass of your favourite indulgence whilst taking in the breathtaking views of downtown Queenstown with a backdrop of the Remarkable Mountains and Lake Wakatipu. The modern contemporary kitchen would be a delight for any aspiring gourmet chef. Bi-folding windows open up over the kitchen bench creating a magnificent panoramic view to behold. A gas fire in the living area creates a warm ambience on chilly winter evenings, supplemented by underfloor heating. With its three bedrooms, all of which command the same stunning view, and 2.5 bathrooms, Remarkable Vista offers a variety of sleeping arrangements that would suit all groups on holiday, whether it is for a family, or a group of friends holidaying together. At the end of a long day on the slopes or tramping through the beautiful wilderness, you can also enjoy a long relaxing spa on the deck whilst enjoying the remarkable view and listening to the babbling creek below, which runs through the property. We wanted for nothing. The views are simply remarkable. The house is beautifully furnished. The spa is in a great position to take in the views. Thank you for staying at Remarkable Vista and thank you for a lovely review. I hope you can come again one day. Great views. Very comfortable at Remarkable Vista. Awesome property, amazing views-totally recommended! Awesome property, amazing views-totally recommended!! The views are incredible. The house is incredible. Sitting out in the spa watching the sun go down and the stars come out was incredible. There's so much to do in the area. The worst part was leaving and having to head back to the real world. Shona was very helpful with directions on getting into the house, and there are lots of leaflets in the kitchen to give you ideas of what to experience while you're there. Definitely staying here again if I ever make it back.